I picked up the tutorial for making this off the internet. Fun to build, but lots of sanding required. That’s really cool! I have watched some videos about making these and I understand how much work went into making this project. Nice work! -- all things possible with patience and tenacity. Thanks for the comments. Lampman, help me out here, I don’t see any tubes or wires going up through that lamp. I know you didn’t drill a spiral, how did you do that? Yes, Lampman where are the wires? 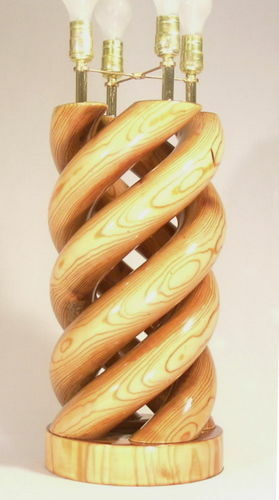 PaulDoug, how did you cut that spiral as it turned out very good! Nice spiral PaulDoug, you should have not problems doing the shells.